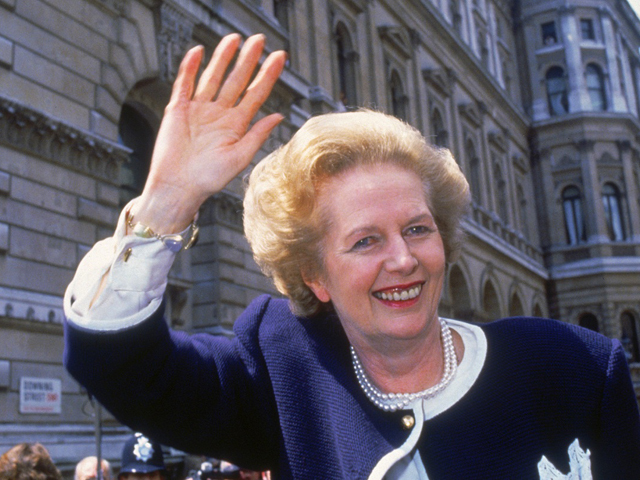 Margaret Thatcher has a high-set and dominant Jupiter finger, a pronounced lower Mars development, slightly bent fingers, a high-set thumb held closely to her palm with a dominant first phalange, long first phalanges of the fingers, a curved heartline, sloping headline and a gap between the head and lifelines. Check out a hand photograph of Margaret Thatcher here. Indira Gandhi has none of these hand characteristics. Gandhi has in fact fairly straight fingers (although her little or Mercury finger is bent, and long as well) with average first phalanges, the thumb held slightly apart and not as thick as Thatcher’s. Nor is it as high-set. 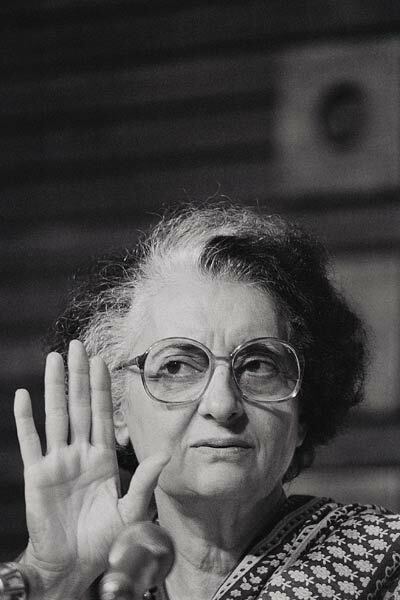 And while Indira Gandhi’s Jupiter (index) finger is a good one, it not dominant and her thumb is average. The mounts of Jupiter and Moon on her hand are developed. The tips of Gandhi’s fingers are almost all conic (unlike Thatcher’s) and her heart and headlines are more or less straight with the head and lifelines slightly apart. Here is a hand photograph of Indira Gandhi's. These signs reveal two distinctly different personalities. Indira Gandhi’s hand tells us that she was at heart a self-effacing person, not arrogant, and in fact even demure to some extent, although she did not lack self-esteem. Intellectually she was clearly inferior to Thatcher, but what she lacked here she gained in other aspects. She did not have the narcissistic qualities that many successful politicians (including Thatcher) possess, although high ambition is shown. Though aggressive, Gandhi was not overtly so, and nor was she self-centred. Her stubbornness was more of a strong inner strength and determination to over-ride what she perceived as threats and obstacles, and less of willfulness. What stands out quite starkly on India’s ex-PM’s hand is her idealism and superstitious attitude, something entirely missing on Thatcher’s hand. Thatcher’s ideas would be based more on rational thought and well, that makes sense as she was a thinker. Gandhi was not. In fact, there is nothing on Gandhi's hand to suggest that she was a great leader, and it is unlikely that she would have been India's P.M if she had not been born to Nehru. An interesting sign on Indira Gandhi’s hand is the broken lifeline. Such large over-lapping breaks are believed to show a distinct change in the life of the person at the time of the break. In Gandhi’s case, this is very likely that there was a marked difference between her early (more reclusive) life and later public life. Some English politicians' hand readings: David Cameron's hand reading and Gordon Brown's hands or check out the hand analysis of Prince Charles from the British royal family. For more readings click on any of the labels below the post for the hand readings of leaders and celebs from all over the world. Another great reading! Indira Gandhi was perceived as a despotic leader by many. There are rumors about her being involved in Sanjay Gandhi's apparent crash . But like every other conjectures , the truth remains a mystery. Inferiority complex is a strong word. It is likely that she felt some type of complex when she was with those who were intellectually superior, but she did not lack self esteem. There is a difference between self worth (esteem) and self confidence. She had a strong sense of self-worth, at least that is what is seen on her hand. Someone like Indira Gandhi might be useful to Indian politics at this juncture. Some level of conviction and determination is required while forming policies. Can you guess if Narendra Modi will become the next PM, based on his hands? Indira Gandhi was a strong leader but she also had a socialist mindset. When it comes to Narendra Modi I do not have a clear enough picture of his hands so that I can make that judgment. If he shows me his hands, I will be able to make out as the event is very near. 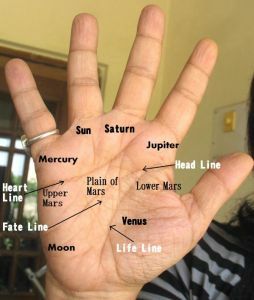 Nita, Can you predict the accidents that are going to happen in the future through palmistry ? Cause once you said you saw the hands of sinbad or some sailor boy who would die from a terrible accident in future. Threats to life can be seen, although they cannot be said to lead to certain danger because danger can be averted. If one knows of it consciously, one can avert it. One has to find out what the cause is, and then it becomes possible to avert it. I am quite sure there will be a sign indicating Indira Gandhi's violent death on her hand. It could be a deep bar, a deep dot, or star or cross or some other sign, perhaps even a grille or deep redness of a line. However I need a clear picture of her hand, a picture taken not more than 1-2 years before her death. Her intuition about her death proves the basic theory of hand reading...that our subconscious mind knows before our conscious mind that something terrible is about to happen. She managed to let this intuition surface, possibly because it was so near. There is no doubt that there was an indication on her hand. And it is very likely that the sign appeared after she attacked the Golden Temple. That one can see signs of danger (I have said clearly and that too in the comment section and not in the main post) is not at all far-fetched or implausible. One can definitely see signs of threats to life. If any hand reader says otherwise I am afraid he knows little about hand reading or palmistry. However the signs are only of danger, at times imminent, not certain death. The certain death can be assumed only after death only as in the case of Indira Gandhi. The signs of death would be expressed differently in different hands depending on how they died and their own psyche. Fearful people for example could have many signs that indicate danger and these signs may go away, and such an incident may not come to pass. That is the reason one should never ever predict death and I never do. And no, a sign cannot "mean anything." There are negative signs and there are positive signs. Ofcourse it is not easy to decipher which signs indicate health issues and which indicate a mental issue, and that is where the skill of the hand reader comes into play. Signs indicating negative health issues are not necessarily shown only on the lifeline. They can be seen anywhere. And yes a broken life line does not mean death and I have very clearly mentioned that in my post. And yes ofcourse I have seen death indicated in hands because I have hand prints with me which I took 30 years ago! And some which my father took, as long as 50 years ago! It is great research material. My cousin for example had a dark red mark like a bar or cross at the end of his lifeline which btw ended one thirds of the way down although now after so many years I mostly remember my reaction to it rather than the actual sign. When I saw it (I was 14) I was shocked but never said a word to him as I did not want to believe it. I had started to learn palmistry by then. He died in a massive explosion on a boat the year after, at the age of 17 years. This does not mean that everyone with this sign will die at that age and that is why I never ever predict. In any case no hand reader should ever predict death even if he is sure as it is not right and can have a damaging effect. My telling my cousin would have been unable to avoid the death as he was not mature enough to take it seriously (he had joined the merchant navy) or take action. It would have simply disturbed him. And you are right about the fact that death may not be seen on everyone's hand. The main reason for this is that it may be many years in the future or it is hidden somewhere and cannot be easily seen. But yes, if the subconscious knows, the signs of death will be there. At times these signs appear a few months before death.